picky eaters are no match for us! As a mother of three, Healthy Nest founder Robin Hutchinson understands the challenges of ensuring your family eats nutritious, whole-food meals. After working with dozens of families to tackle common nutrition obstacles, Robin designed Healthy Nest’s Family Nutrition Makeover Program. Appropriate for families with kids school-age through teens, the Family Nutrition Makeover Program includes three sessions with a personal nutritionist along with meal plans, recipes, grocery-store cheat sheets and other tools and tips to help you feed your family healthy, whole foods every day. Session 1: A Healthy Nest nutritionist will meet with one or both adults in your family to discuss your current eating patterns and challenges such as time, money, cooking ability and picky kids. Then, we’ll establish action items such as healthy food swaps, recipes to try and grocery shopping changes. You’ll walk away with a clarity about where you are and where you want to be. 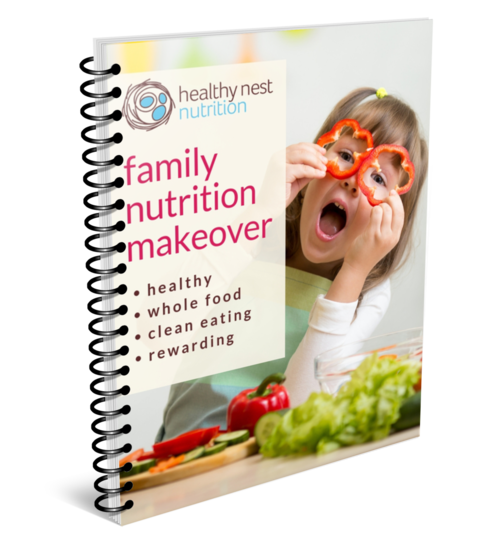 You’ll receive a 55-page Family Nutrition Makeover Guide. Session 2: First, we’ll discuss what went well and what challenges you faced since your last session. School-age children are welcome, and your nutritionist will talk to the family about age-appropriate nutrition. You’ll leave with more action items tailored to your family (for instance, if your child will only eat white foods, we might send you home with a cauliflower recipe that has been successful with other picky kids). Session 3: By the third session, you will be seeing positive changes in your family’s eating routine! We’ll address any remaining areas where you might be struggling and talk about doable solutions. Your nutritionist will also look at what types of foods and recipes work best for your family and help you plan for variety moving forward. After this session, you’ll be prepared for long-term success with grocery shopping, meal planning, food-prep tips and recipes. Growing kids need a varied, nutrient-filled diet in order to grow, learn and thrive. You’ve probably heard about the gut-brain connection — one that’s especially important in children. Kids (small and large) who are experiencing brain fog, focus and concentration issues, ADHD, dyslexia, dysgraphia, mental exhaustion and mood swings are not balanced nutritionally. Let us help you clear the cobwebs and infuse them with nutritious food. A whole-food diet with targeted supplementation REALLY helps kids’ brains. Plus, teaching your child how to eat healthy from a young age is one of the best gifts you can give them! A take-home guide filled with snack ideas, meal plans, recipes, shopping lists and more!